President Eisenhower was at the helm as the 34th US President after serving as the first Supreme Commander of NATO. Raised on a diet of Kansan work ethic, Eisenhower was relentless in his military and subsequent political career pursuits, even into old age. Dwight David Eisenhower was born in Denison, Texas on October 14th, 1890. He grew up in Abilene, Kansas, were his poor family’s forebears had settled as part of a religious community. He and his six brothers grew up in an environment characterized by hard work and guided by a strong religious morality. But ‘Ike’, as he was soon known to everyone, was a gregarious, fun-loving youth, with a great passion for sports and little enthusiasm for academics. After graduating from Abilene High School in 1909, and spending a year working to put a brother through college, Eisenhower entered the US Military Academy at West Point to pursue an education and a military career of his own. World War I ended before Eisenhower was posted overseas, but his role in World War II more than compensated. 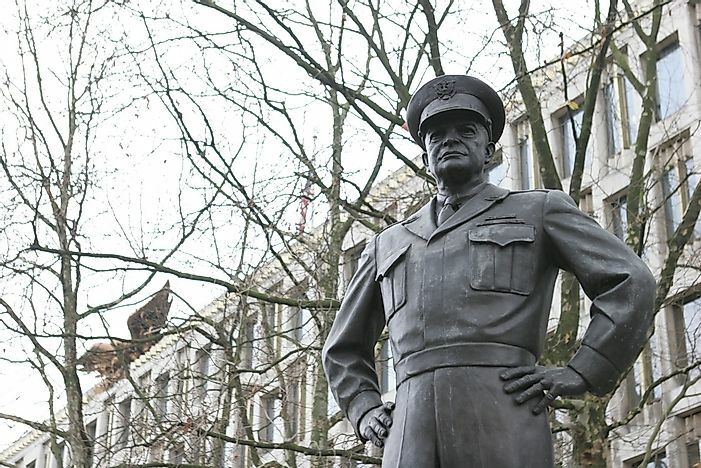 In June of 1942, he was selected from over 366 officers to command as superior of all US troops in Europe. Such a rapid advancement was due as much to his personal qualities of friendliness, sociability, humility, and optimism as to his exemplary military talents. In December of 1943, he was appointed as Allied Supreme Commander in Europe, and oversaw the famous D-Day Invasion that ultimately secured victory over the Axis in Europe. With Truman’s popularity waning, Eisenhower was urged to run for President. He won over a vast following of supporters, running on a tireless campaign which convinced people of his warmth, sincerity, and lack of pretension. Ultimately, he ended up assuming the role as America’s 34th President in 1953 after soundly defeating Adlai Stevenson in the Election of 1952. He would beat out Stevenson for office once again four years later. During his two terms in office Eisenhower, as a moderate Republican, was able to pursue his domestic policy agenda without too much opposition from the Democratic majority in Congress. There was no sharp break between the policies of the previous Democratic administrations and Eisenhower's own, including his handling of the New Deal and Fair Deal programs he inherited. He beefed up Social Security, established the Department of Health, Education and Welfare, and created the Interstate Highway System, the biggest public works program in US history, and arguably one of his greatest legacies. Abroad, Eisenhower helped bring an end to the Korean War, and sought rapprochement with the Soviets through his ‘open skies’ policy of continuous air-inspections of one another’s military installations. The Cold War, with the increasing threat of Soviet Nuclear weapons technology, was the major challenge for Eisenhower and Secretary of State John Foster Dulles’ foreign policies. The pair strove for collective defense agreements, and succeeded in creating SEATO, the Southeast Asia Treaty Organization, to complement an expanded reach for NATO. Containing over-reaction to the spread of Communism in the US itself was also a major challenge, thanks in large to the anti-communist ‘witch-hunts’ of Senator Joe McCarthy. No fan of McCarthy himself, Eisenhower, in order to avoid a party split, worked behind the scenes to diminish McCarthy’s influence and discredit him. Eisenhower enjoyed high approval ratings throughout his two Presidential terms. After leaving office in 1961, he retired to write books and memoirs, dying within the decade on March 28th, 1969 from heart failure. “I like Ike!”, Eisenhower’s Presidential campaign slogan still has credence even today, as Eisenhower is held in great esteem and affection across the political spectrum. Some historians, however, have also condemned him for his secretive use of the CIA to overthrow the governments of Iran in 1953 and Guatemala in 1954. He has also been criticized for his ‘go-slow’ approach to desegregation policies, though he signed mage civil rights legislation, in 1957 and 1960, the first such acts since the 19th Century. He was also the last president in American history to have been born during the 19th century.